Notes: Leonardo da Vinci is a world subject and one of the greatest collections of his work is owned by Her Majesty the Queen within the Royal Collection Trust, housed in the Royal Library at Windsor Castle and some of his finest works housed within the Royal Collection are reproduced on these stamps. On the 500th anniversary of the death of Leonardo da Vinci 144 of his finest drawings from Royal Collection Trust are being displayed during 2019 at 12 museums and galleries across the United Kingdom. My cover for this issue depicts one of his most famous paintings and is in a limited edition of just 60 copies worldwide. Each is printed on the finest textured linen paper and then lovingly hand made into envelopes. The above Royal Mail Leonardo da Vinci stamps were issued on 13 February 2019 by Royal Mail and feature the following stamp designs: 1st Skull; 1st Guelder-rose; 1st Cats; 1st Plants; 1st Anatomy; 1st Leda; 1st Bearded man; 1st Skeleton; 1st St. Philip; 1st Woman; 1st Horse; 1st Fall of Light. 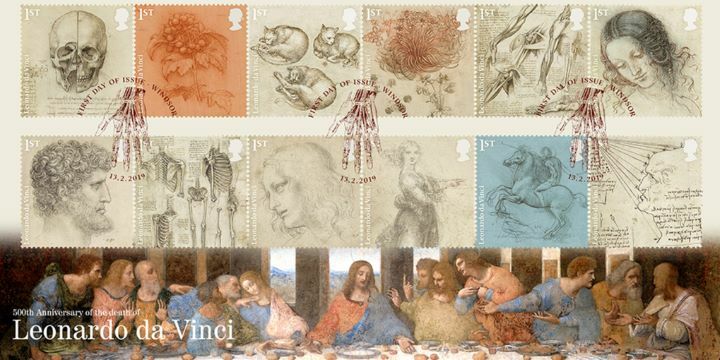 The The Last Supper first day cover with the Windsor, Skeleton of hand, Special Handstamp postmark has been produced by Bradbury and features these stamps which can make a very collectible and lovely gift.